Now before we go into the data I want to take a few moments to give a general overview of the data. All of the results are based on the voting data from the 2016 Federal Election of Australia on the 2nd of July 2016 collected by the Australian Electoral Commission. Now there are a couple of small notes, since the election there have been some changes in the construction of the Parliament due to a number of by-elections, party resignations, and indeed some political parties in this article don’t exist anymore, but that is not a big issue for us as we are looking at the elections as a snapshot of that one moment and how 14,262,016 people voted. As well as this, there are some peculiar quirks of the Australian system like compulsory voting that might change the data a little bit but this does not change the underlying bases for the analysis. The data also assumes that this is a free and fair election, that there was no voter suppression, or gerrymandering going on, which is not something you can say about all elections in the world. Finally, this is not meant to be a definitive look, and as such there were a lot of judgement calls as to how to assign seats when we get down to the 2.64 seats etc. I have made some calls which may change the outcomes a little bit around the edges but not significantly. The Coalition: This is the group of conservative, generally Centre-Right parties that form one of the main factions in Australian Politics, focusing on a more pro-business, social conservative platform. In order of size, there is The Liberal Party, The Liberal National Party (LNP), The Nationals, and the Country Liberal Party. For the purposes of this,we have grouped them all together, mostly because in Queensland, The Liberals and The Nationals merged to form the one party which, besides being a bad idea,messed with our nice state-by-state comparisons, so it was just easier this way to group them all together. Sorry to our Canadian readers where The Liberal party is the left-leaning party, and thus the opposite of how it plays out in Australia, just to be confusing. The Australian Labor Party: This is the second main faction in Australian politics and tends to fall on the Centre-Left. The ALP tends to focus on more working and middle-class issues (unless they are willingly dragged to the right on immigration) and still have a strong support base in Australia’s Union movement.Please note it is the Labor Party, not the Labour Party because they allegedly had an American romance moment that we are still dealing with. The Greens: One of the younger political parties in that I am technically older than it,but is a growing force in Australian politics. As the name suggests it is Australia’s party that sits firmly on the Left of the political spectrum, focusing on a number of environmental and social issues. Independent Candidates: These are people that do not belong to any major political party (or have not yet gotten around to forming their own one yet) and so can fall across most of the political spectrum even though a lot of them tend to be former National Party members. Misc. Christian Parties: There are a number of Christian parties that exist on the Right to Far-Right on the political spectrum. Because of their many similar (though not identical)policies we have grouped them together here for sake of clarity. The Nick Xenophon Team: This is the political party based around former long-time senator Nick Xenophon from South Australia. While their policies are quite ranged they do tend to sit more in the Centre of the political spectrum. Pauline Hanson’s One Nation: This is apolitical party formed by shock horror Pauline Hanson that has unfortunately existed in some form or another since the late 1990s and has a political base in Queensland. It sits on the Far-Right of Australian Politics, like the leader of the party congratulating the Sentinelese people on killing a missionary for their strict immigration policy Far-Right. Katter’s Australia Party: Based around Bob Katter and his family and based in North Queensland, this party focuses on economic protectionism and regional issues and tends to fall on the Right side of the political spectrum. Animal Justice Party: A political party based around Animal welfare issues and giving them a voice in the political process. They focus on issues like the deplorable live animal exports that at time of writing was still happen, come on Australia. It falls on the Left side of the political spectrum and we would have likely grouped it together like the Misc. Christian Parties if there had been any other left-leaning smaller parties like this. So with this in mind let’s dive into the world of voting systems. This means that The Coalition has a commanding lead in the Parliament with 91 seats compared to Labor’s 54. Now for many, including the people of the UK that voted to keep this electoral system, this is a perfectly fine result,and that has a ring of truth to it. Because they won the support of the largest chunk of voters in each of their electorates. However, as we will see,this gives The Coalition 60.3% of the seats in the Parliament but they only received 43% of the vote, an almost 20% difference. For many, a 20% margin of error is a big problem and we have seen that play out in the UK’s recent elections. In this result, we start to see a closer relationship between the results and the votes the people of Australia gave. With The Coalition getting 76 seats, and the ALP getting an increased 69 seats as they benefit from preference flows from The Greens much like within the Coalition the Liberals benefit from preference flows from The Nationals. However, there are still some interesting quirks, for example, The Greens only get 1 seat (0.6%) in Parliament however they got 10% of the vote nationwide. Proportional Representation Voting by State. 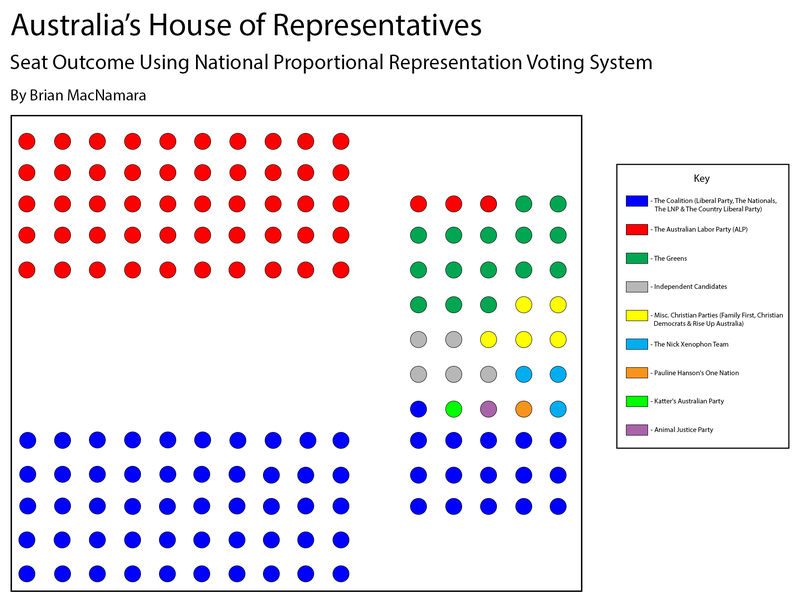 Here we see a dramatic shift in the make-up of the House of Representatives, with a surge of minor parties now sitting in the cross-bench, 33 compared to just 5 in the Alternative Vote method. The biggest beneficiary of this is The Greens who now have 16 seats in the House of Representatives. As well as this, The Coalition now only have 66 seats, and while this still makes them the largest party, they are no longer in the majority. There is also a big drop in Labor seats, to 51, now they are no longer propped up by The Greens in many seats. One would imagine that a Parliament like this would have dramatically different governing priorities as both sides of the political spectrum would need the support of minor parties to pass legislation. When we use proportional voting at the national level rather than the state we end up getting a similar but not quite identical outcome that working at the state level. So there are some changes, like when One Nation has to fight on a nation-wide ballot it only gets 1 seat compared to the 3 if we work by state. However, most of the changes sit around the margins rather than any dramatic change. For example, The Coalition has the identical number of seats, 66, like last time.However, unlike the First-Past-The-Post system,The Coalition received 43% of the vote and got 43% of the seats rather than the over 60% of the seats. In the end, what does this all mean? 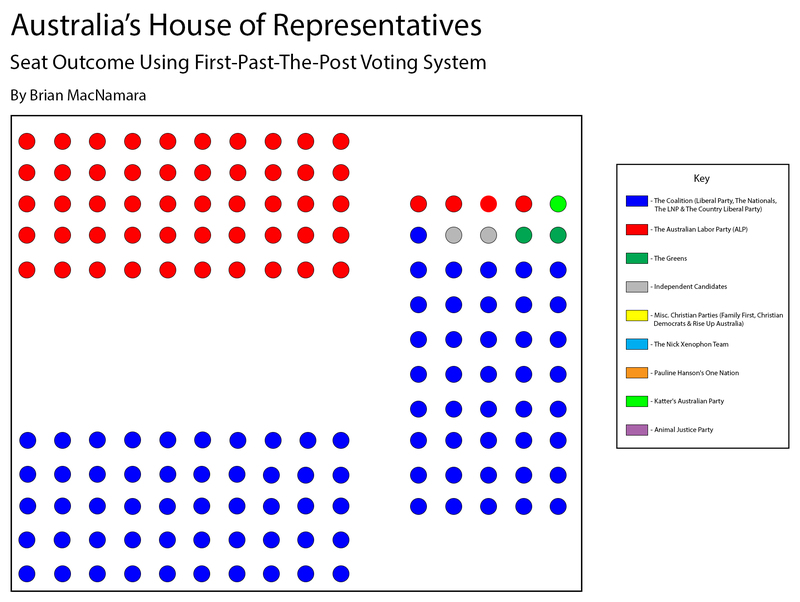 Well what it means that using the same 14,262,016 votes I was able to get four different outcomes in the House of Representatives, and this is not an exhaustive list of voting systems, these were just the four easiest ones I could construct using the data on hand. 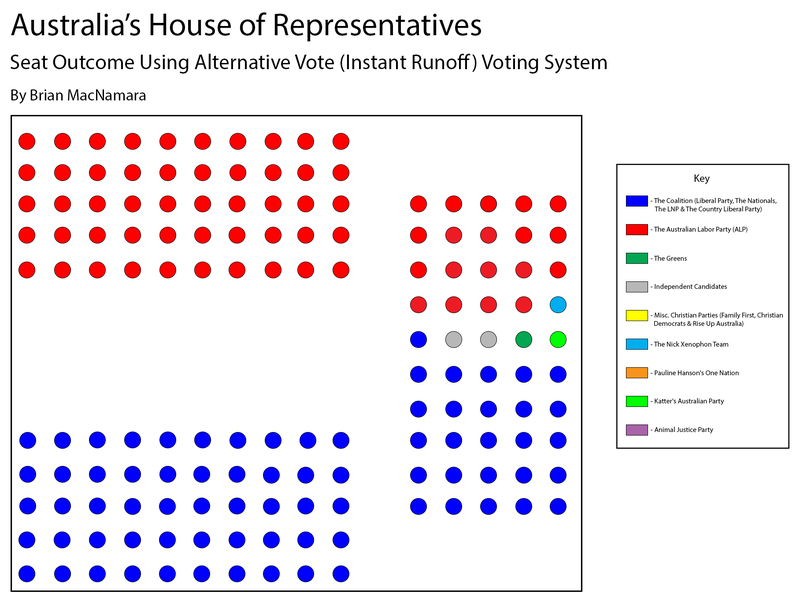 Thus the very nature of the House of Representatives would dramatically shift depending on its composition, and this is why looking at voting systems is such an important thing. Fun final note: there was one constant across every system I plotted out. No matter what variable I threw at the data The Katter Australia Party only ever got 1 seat. Feel free to share this article on any of the social medias and you can follow us Here. Check out all our past reviews and articles Here, and have a happy day. This entry was posted in Articles and tagged Alternative Vote, Australia, Australian Electoral Commission, Election, First-Past-The-Post, House of Representatives, Instant-Runoff, Political Science, Politics, Preferential Voting, Proportional Voting, Senate, Voting, Voting Systems by tldrmoviereviews. Bookmark the permalink.